Dec 31 – Happy New Years! Haven’t posted in a while, not much happening over the holidays. I have several Road Trip Trades (similar to the Rhino) on the SPX and I’ve still got Feb Rhino’s and some March Rhino’s going. I am about 35% invested at the moment. Going to up it first week of the year as volume starts getting back up. I haven’t had to do much over the last 2 weeks (I added a few call calendars to both the SPX and RUT Rhino’s I had on over the break) but that’s about it. Easy. I plan to reformat the blog a bit in the New year and post real-time updates to the trades I am doing. I just have to get into the rhythm of it. Posted on December 31, 2015 Categories TradesTags broken wing butterfly, BWB road trip trade, dan harvey road trip trade, john locke m3, m3, rhino m3, rhino m3 trade, rhino tradeLeave a comment on Dec 31 – Happy New Years! Exit 15-40 DTE unless forced out earlier. Enter on a flat or down day where volatility is higher. Place upper long within 5 points of the market. Place shorts 40 points and lower longs 90 points below upper longs. Ideal entry price is below 100 but can go up to 125. Try to leave the position alone for at least 30 days unless SPX has a large move. If SPX is more than 30 points above upper longs then start rolling them down one-by-one to raise the expiration line above zero. If SPX moves to the lower 1/3 of the tent early in the trade then either exit or buy debit spreads to protect the position. The long of the spread should be at the B/E point of the expiration graph and the short should be 20-25 points lower. If SPX moves down later in the trade then exit. Interesting few days. We’ve got that 25 BPS rate rise and the market went up quite a bit only to fall the next day back to where it started. Not much to say nor do I really have market opinion right now. I am like 90% cash as I closed a lot of the Jan and only had about 25 units of Feb Rhino on. I will enter March Rhino in about 10 days and I entered an SPX like Rhino trade which requires a lot less adjustment. The T+0 line is a thing of beauty. Other than that, it’ll be a quiet few weeks until I can ramp back into the trades. I started this blog about a year ago trading Modified iron condors, the protector and some trend-following strategies and I am ending the year as pretty much only a butterfly trader. It’s been quite the journey with an immense amount of learning fuelled by dramatic ups and downs. I feel a million times more comfortable and confident as a trader and I’ve come to learn the value of appropriate risk management. Looking forward to a big year in 2016. I am mostly in cash going into this week (65%). I have some Jan and Feb Rhino trades but I am not fully allocated by any means. I am going to wait until after the fireworks that will be OPEX and the Fed meeting before entering more of these. After such a harsh down move and the potential for wild volatility in either direction, it’s just not worth it. Any large up move will bring challenges to the Rhino. 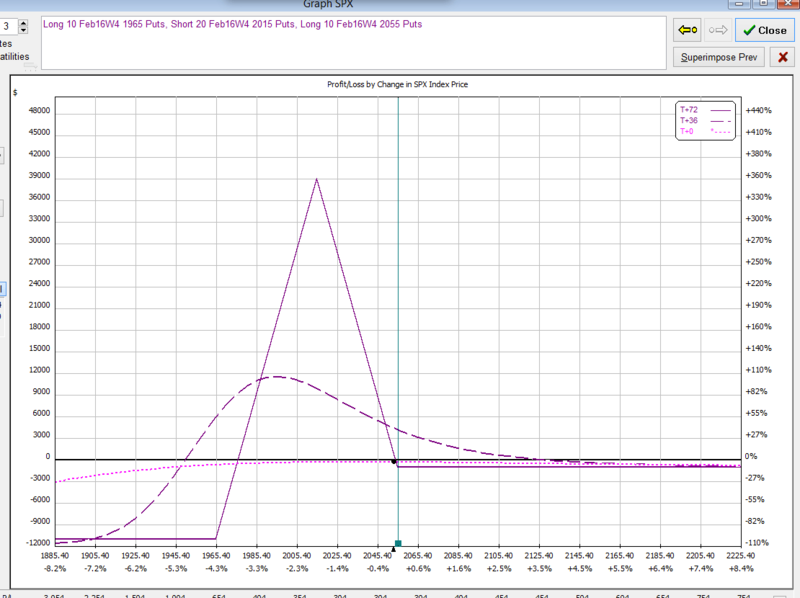 In fact, If we had a quiet week, I’d have removed most of January Rhino trades @ about 5% profit. However, I will be selling put spreads @ 15 delta (same strikes as you would for an MIC) on any big weakness on Monday or Tuesday. 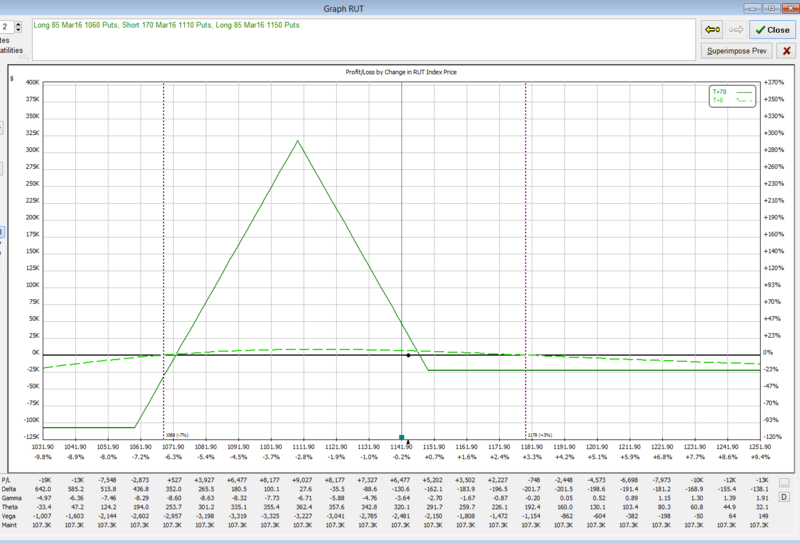 The strikes will likely be way way OTM with the surging VIX and it should give us a perfect risk reward trade. If, after I sell these, the market continues to push sig. lower, I’ll manage by buying bearish butterflies along the way and perhaps some debit spreads. I am looking forward to taking advantage of a waterfall event this time around. We should have a down Monday as the stat is 95% of the time we have a 1.5% or greater move on Friday, you’ll have a lower low on Monday. Oil was down 11% this week and since the high yield market is quite exposed to oil, there is credit concerns. Selling was extreme on Friday and that usually means further weakness. However, breadth is at extremes, the NYMO is at extremes, and VIX gained 63% this week. Those types of extremes usually mean a bottom is soon coming and we’re entering a bullish period. My bet is more pain on Monday/Tuesday, followed by a rebound. I removed several 1160 BWBs for between 6.1-6.55 credit (I paid about 3.20 for them) so I closed them for a nice profit and cut my downside risk in half. I also added some 1100 bearish butterflies on each bounce as an additional hedge to the downside. The Jan Rhino’s ended the day at a delta of about 20 per unit. I am comfortable with that. We’re uber oversold on all levels. NYMO is reaching extreme levels and though I expect a down day on Monday, I think we’ll bounce off the SPX 1980-2009 area by Tuesday once we reach that extreme NYMO level. When volatility is high and we’ve got additional room to the downside, I like to buy Bearish butterflies as a hedge to my existing positions since they can be quite cheap. I only had Jan and Feb Rhino trades on during Friday’s fall and we ended the day neutral with no gain or loss (well ~-1200 according to my IB statement) but that’s negligible. Gotta love that. The RUT has moved from 1205 to 1120 (85 points) in a very short timeframe and the trades are all up money. I closed all of December trades yesterday. Seems like it was good timing as the futures are pointing to a big down move. We’re about 1.5% down as I type this. Markets are puking. If it gets serious, watch for the big guys to start dumping (AMZN etc). There’s a lower gap open around 2020. Probably a target for now. If it goes through that we’ll probably see 1980 and maybe even 1920. We’re quite oversold, so perhaps this is the start of capitulation. Below 204 is not good. A lot of stops will be triggered. Market opens and it bounced a bit. I tried to put on some bearish butterflies to hedge my rhino a bit but wasn’t able to get a fill. It’s starting to puke a bit now with SPY at 202.86 (falling from a 203.6 bounce). Pretty gross. I am trading from the boat today with a few friends. I pretty much neutralized the December trades yesterday. The December trades themselves are very profitable, it’s been a great month. I was a bit pissed off yesterday when I made the worst timed adjustments ever, I literally adjusted when RUT hit 1151 (the absolute low!) and had it rebound literally 30-60s later up to 1159. Annoying. If the trades weren’t so high gamma and close to Expiry (9 days), I’d have waited till 2:30pm but the deltas got high and I can’t trust OVs model yet (which spits out too delta negative). Probably a few k in adjustments right there. The January rhino had 10 call calendars taken off to lessen the positive deltas. This was the first adjustment of the trade. I entered another 1170 Feb Rhino. I’m almost 75% cash right now as I unwind December. I’d normally just jump in a Feb Rhino but the looming Dec OPEX and potential rate hike in 7 days has me wanting to wait until the fireworks are over. It’s only another week or so. As the months have gone by since Aug, I’ve been peeling more and more of the protector off and I am down to 25% of what I was, I was hoping for a normal santa rally to get the rest off, but so far it’s been mostly a volatile range. I’ll keep it on until early Jan and, if I see opportunity for options trades and it requires my margin, I’ll remove it at that time. The pre-market is down about 1% and VIX is ready to open at the highs of yesterday. THere’s some major support at SPX 2053 so we should see a pause there. The increased volatility will make for some difficulty getting these remaining M3 trades off. I entered the day quite delta negative so that’s one positive. As long as it doesn’t break RUT 1148 we should have an OK day. My plan is to peel off portions of the trades as the market puts pressure on respective sides. Ideally, we can close it all off after we get a little bounce. When RUT hit 1152 my deltas were too positive so I had to adjust, literally 2 minutes later, the market shoots up to 1160 🙂 I am waiting till 2:30pm to adjust and/or get more and more out of the trades. Volatility is high as is gamma. Jan/Feb trades are all doing just fine. Only in Rhinos for those months. I started the day pretty delta negative and took off a few 1140 BFs around 10 min into market open (i regretted this later) based on prices I had calculated as good from the days previous. Usually you can get exceptional fills in the first 15-30 min of market open but only if you really know what the price should be as spreads tend to be larger. I don’t usually do this as I wait for normal adjustment times, but this time around, I had put in orders at prices much higher than on Friday. They got filled. Though I corrected some negative delta’s, the RUT started to fall quite a bit (about 1.5%) and that increased volatility had me in a bit of a scurry removing portions of the trades and keeping things relatively balanced. Ended up at EOD better off than we were @ open or at close on Friday. Unwinding the large M3s that I had on is much more complicated than the Rhinos. I got about half off today and will be removing the rest through the next few days. The trades are all more profitable then they were on Friday, so all is good. I ended the day fairly delta negative again. I’ll need to get more BFs off tomorrow to get it balanced out but likely it’ll just be a day of peeling off the December trades once and for all. All of the trades were very profitable. 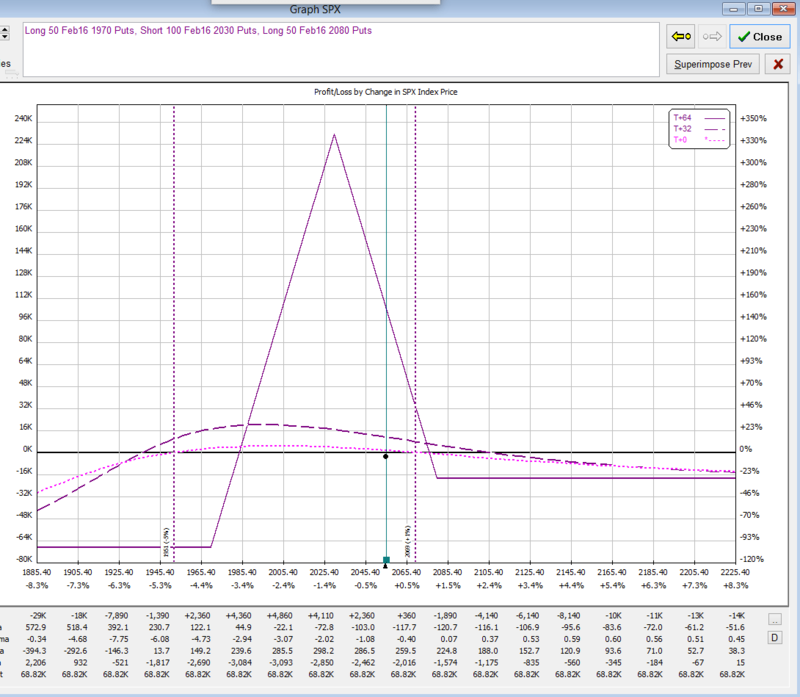 There is 1.1 Trillion of options expiring 2 days after the FOMC meeting. It’s the largest LEAP month ever. Typically price can sometimes pin to where the most open interest is. In this case its 1800 which is 200 points downwards. Neat.